The most important game in the last round took place in Panama City between third ranked Panteras (5-5) and fourth ranked Caballos (5-5) on Saturday night. Panteras were defeated by Caballos at home 74-89. Caballos looked well-organized offensively handing out 22 assists. Worth to mention a great performance of Puerto Rican point guard Alvin Cruz (186-82, college: Niagara) who helped to win the game recording 20 points and 6 assists. Nigerian-American power forward Ike Okoye (206-86, college: Boise St.) contributed with 14 points and 12 rebounds for the winners. Caballos' coach David Rosario used a ten-player rotation which allowed the starters a little rest for the next games. Puerto Rican guard Jorge Matos (185-92) replied with 17 points, 9 rebounds and 9 assists for Panteras. Caballos have a solid three-game winning streak. They moved-up to third place, which they share with defeated Panteras. An interesting game for Halcones (8-2) which hosted in Panama City their biggest opponent Correcaminos (7-3). First ranked Halcones managed to get a 5-point victory 77-72. It was a key game for the top position in the league. American power forward Kwame Alexander (201-90, college: CS San Bernar.) had a double-double by scoring 18 points and 11 rebounds to lead the charge for the winners and Christophe Massie chipped in 13 points and 16 rebounds during the contest. At the losing side American forward Terrence Shannon (203-79, college: Elgin CC, agency: DTMones) responded with a double-double by scoring 18 points and 11 rebounds. Halcones have an impressive six-game winning streak. They maintain first position with 8-2 record. Defending champion Correcaminos keep the second place with three games lost. Toros' fans can finally celebrate the first win of their team after nine consecutive losses. The victory is especially important as it came on the road game in Panama City, where they defeated Aguilas (4-6) 80-64 on Saturday. Joel Munoz notched a double-double by scoring 15 points and 12 assists to lead the effort. Even 22 points by Thelbert Green did not help to save the game for Aguilas. Aguilas' coach rotated eleven players seeing no chance for a win. Toros maintains sixth position with 1-9 record. It was Aguilas' third loss in a row. They keep the fifth place with six games lost. The most important game in the last round took place in Panama City between third ranked Panteras (5-5) and fourth ranked Caballos (5-5) on Saturday night. Panteras were defeated by Caballos at home 74-89. Caballos looked well-organized offensively handing out 22 assists. Worth to mention a great performance of Puerto Rican point guard Alvin Cruz (186-82, college: Niagara) who helped to win the game recording 20 points and 6 assists. Nigerian-American power forward Ike Okoye (206-86, college: Boise St.) contributed with a double-double by scoring 14 points and 12 rebounds for the winners. Five Caballos players scored in double figures. Caballos' coach David Rosario used a ten-player rotation which allowed the starters a little rest for the next games. Puerto Rican guard Jorge Matos (185-92) replied with 17 points, 9 rebounds and 9 assists and Dominican power forward Brayan Martinez (203-91) added 18 points and 12 rebounds in the effort for Panteras. Caballos have a solid three-game winning streak. They moved-up to third place, which they share with defeated Panteras. An interesting game for Halcones (8-2) which hosted in Panama City their biggest opponent Correcaminos (7-3). First ranked Halcones managed to get a 5-point victory 77-72. It was a key game for the top position in the league. American power forward Kwame Alexander (201-90, college: CS San Bernar.) had a double-double by scoring 18 points and 11 rebounds to lead the charge for the winners and the other American import center Christophe Massie (206-77, college: Memphis) chipped in 13 points and 16 rebounds during the contest. At the losing side American forward Terrence Shannon (203-79, college: Elgin CC, agency: DTMones) responded with a double-double by scoring 18 points and 11 rebounds and Nicaraguan center Bartel Lopez (212-89) scored 6 points, 19 rebounds and 7 blocks. Five Halcones and four Correcaminos players scored in double figures. Halcones have an impressive six-game winning streak. They maintain first position with 8-2 record. Defending champion Correcaminos keep the second place with three games lost. Toros' fans can finally celebrate the first win of their team after nine consecutive losses. The victory is especially important as it came on the road game in Panama City, where they defeated Aguilas (4-6) 80-64 on Saturday. Toros forced 19 Aguilas turnovers. Point guard Joel Munoz (183-80) notched a double-double by scoring 15 points and 12 assists to lead the effort and Gil Atencio (202-96, college: St.Clair) supported him with 18 points, 8 rebounds and 4 assists. 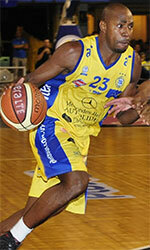 Even 22 points by point guard Thelbert Green (188) did not help to save the game for Aguilas. 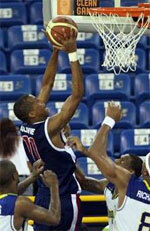 American center Travis Elliott (203-91, college: Beth.-Cookman) added 13 points and 8 rebounds for lost side. Five Toros and four Aguilas players scored in double figures. Aguilas' coach rotated eleven players seeing no chance for a win. Toros maintains sixth position with 1-9 record. It was Aguilas' third loss in a row. They keep the fifth place with six games lost.